Peel and chop the onion into 1 inch pieces, then sweat gently for about 10 minutes until translucent. Meanwhile peel and cut the artichokes into similar size pieces and add to the onions. Continue to cook for another 10 minutes. Bring the stock and milk to the boil and pour over the onion and artichoke mix. Bring back to the boil and simmer for 15 to 20 minutes or until the artichokes are cooked. Add the cream, re-boil and season the soup to taste. The soup is now ready to be served as it is or it can be liquefied and strained through a sieve for a smoother consistency. 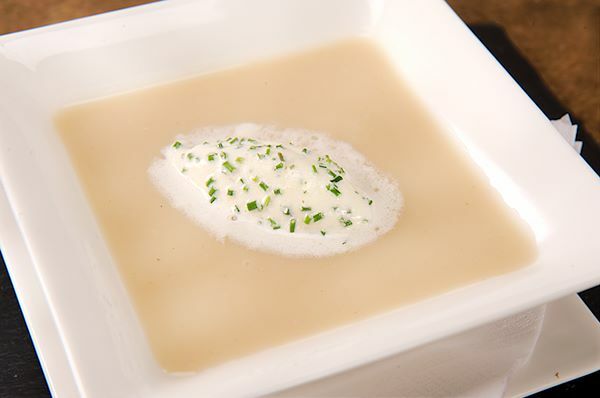 To add a little variety to the soup it could be finished with a fresh Chive Mousse.